NASA EarthKAM (Earth Knowledge Acquired by Middle schools) enables students, teachers, and the public to learn about Earth via photographs taken from space. This growing collection of Earth images come from middle school students around the world who used the Internet to target areas of Earth to be photographed with a digital camera onboard the Space Shuttle and International Space Station. These images are available to everyone through a user-friendly data system. Users can search for images of the earth by geographic area, feature, country, mission or school. The collection is wide reaching, and includes land features, water, atmospheric systems, and human impacts. 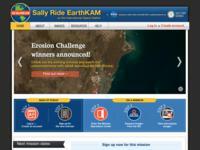 Middle schools (grades 5-8) can apply to join the EarthKAM Community. Community schools use the EarthKAM images in inquiry-based investigations and can even become Flight Certified, which enables them to take their own images of Earth from space. Also included is a section for educators, which provides tips and guides on how to incorporate these images into daily lessons.